Because it works, says Radio 4’s The Bottom Line. Click here to listen to The Bottom Line on BBC iPlayer. 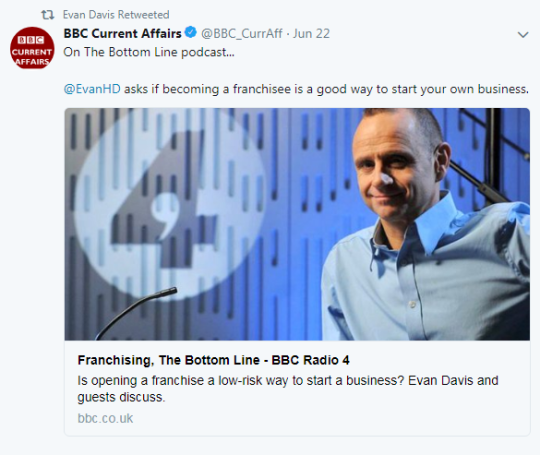 In a recent edition of Radio 4’s business programme, The Bottom Line, Evan Davis and his guests discussed the ups and downs of franchising. The programme makes interesting listening for anyone who has ever thought of starting their own business. Davis was looking to find out what’s special about franchising and why, for some, it could be better than building your own brand from scratch. Let’s begin with some statistics. Franchising is good for the economy: in the UK there are over 900 franchises of all types, generating around £15bn of revenue every year. This is also good news for those looking for a job, because the franchise sector creates a huge number of employment opportunities. And when it comes to getting that all-important finance, it seems the banks are often prepared to dig deeper for a franchise than for other new business ventures – no doubt a reflection of the confidence generated by those five-year survival rates. The franchising model is simple, as Davis explained using McDonald’s as an example. You take a well-established brand and let independent proprietors open their own branches. Using your off-the-shelf, proven method, franchisees are able to avoid much of the risk associated with going it alone. One man who definitely benefited from the McDonald’s franchise was Ken Deary, who is now chief executive of Right At Home, a franchise that provides personal care and companionship for people in their own homes. Before becoming master licensee for Right At Home in the UK, Deary was a highly successful franchisee for McDonald’s, scooping up the British Franchise Association’s (BFA) franchisee of the year award. Deary wanted to do something different after McDonald’s, hence the Right At Home venture, which now has 52 offices across the UK and turns over £32m a year. His experience proves you don’t necessarily need a background in the franchise type you opt for. Subway franchisee Rachana Pancholi is also proof of this, coming as she did from a large corporate background. She decided to try franchising following a career break, doing her research via the BFA and attending the National Franchising Exhibition. What did come in handy was her marketing experience. She spotted a gap in the market for healthy fast food on the high street, took on a Subway franchise, and hasn’t looked back. Starting by turning around a failing store, she now has seven and is about to open another two. Two-time winner of the BFA’s Franchisee of the Year award, she says she has no regrets whatsoever – she loves what she does and she loves the food too. Obviously we’re hearing from those who are really making franchising work for them and, to be fair, the programme’s remit is to have ‘business conversations with people at the top’. But the programme’s third guest, lawyer Ros Goldstein, who specialises in franchise law, was there to weigh in with a sense check: not all franchisors are alike – it’s essential do your homework before signing up. Typically a franchise agreement will commit you to running the business for at least five years, and you get to renew after that if everything has gone well. But, she says, it’s important to understand your obligations. For example, should you surrender your franchise after five years, you can’t simply set up on your own in the same town doing something identical. And of course you’ll need to pay an up-front fee, which will cover your set-up costs, plus ongoing monthly fees which usually represent a percentage of your turnover. Although the start-up investment can vary hugely – for example, with some franchises you don’t need commercial premises – the cost of creating a business from scratch probably would be much greater. And as Deary points out, you’re buying into an established brand, with a franchisor that will provide the intellectual property, operating systems, IT, training and marketing support you’ll need, as part of the start-up package. There’s no doubt that for some, going it completely alone, ‘being’ the brand, is part of the thrill of working for themselves. But for many, the fear of leaping without a safety net is very real. And it’s one that franchising addresses head-on. Both Deary and Pancholi are adamant that the support franchisees get from franchisors is what helps ensure those impressive survival stats. With a franchise, they say, while you’re getting value from the brand, you still have autonomy – you’re not a clone. You get a first step on the business ladder, the chance to capitalise on the success of those who’ve gone before you. And of course the franchisor has to keep evolving and ensuring it provides as much support as its franchisees need, because the success of one is the success of all. Listen to BBC Radio 4’s ‘The Bottom Line’ business programme about franchising, by Evan Davis and his guests here. More blogs from Mail Boxes Etc. Is your business an open book? Can you get one past our goalie? Are you ready for GDPR? We can help. Finished your dissertation or thesis? You need to read this! Dissertation doing your head in? Don’t email it, write it! Discover New Opportunities with Mail Boxes Etc. Lickswishy and delumptious – it’s Roald Dahl day! Are you a ‘serial returner’? It’s National Stationery Week! We’ve got all the gear. View our full Tumblr blog "archive"
Franchising with Mail Boxes Etc. Meet with Mail Boxes Etc.